Kate Scully Owens was seriously injured in a car accident two weeks ago. TWO WEEKS AGO, Kate Scully Owens was involved in a serious car accident close to her home near Naas, Co Kildare. The accident was a life-changing one, with Kate sustaining a broken collarbone, shattered pelvis, internal organ damage, and multiple stitches to a face wound. The damage will take months to heal, and will leave permanent scarring, in more ways than one. Last Wednesday, 24 June, the Leeds Building Society, a sub-prime lender with an office in Dublin, were due to evict Kate (who works as a fashion wholesaler) and her 10-year-old daughter from their family home. 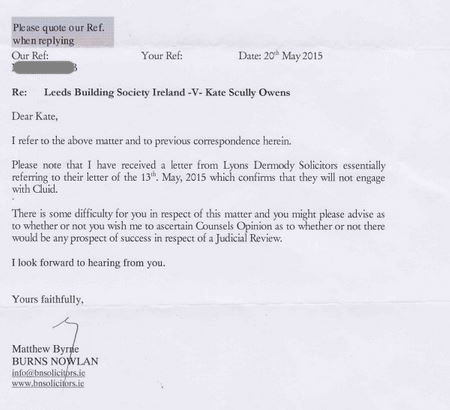 But, proving that a little perseverance can go a long way in the Irish legal system, Kate’s separated husband Dylan Owens, father to their daughter, went toe-to-toe with barrister Rudi Neuman (acting for Leeds Building Society) before a High Court judge early this week as a lay-litigant and argued for an injunction against the eviction. His efforts put a temporary stay on the eviction with 24 hours to spare, while the application for an injunction due to Kate’s injuries will now be heard this Tuesday, 30 June. “We couldn’t believe how unwilling to engage with us the bank has been,” Dylan told TheJournal.ie. Even when they heard the extent of Kate’s injuries. Their lack of compassion is immoral as far as I’m concerned. I had a heated phone call with Conor Butler, (Leeds’ head of operations in Ireland who could not be reached for comment), early last week. He expressed ‘sincere sympathy’ for Kate’s situation, but refused to postpone the eviction. It would have been so easy for him to ask for Kate’s medical certificate and to call-off the sheriff until she returned to health, but he was having none of it. We can’t deny the mortgage is troubled – that’s a matter of record. All we wanted was to engage to work out a scenario that was beneficial to everyone, but the bank simply wouldn’t listen. Owens, an independent media producer, has been separated from Kate for four years. He no longer lives in the house in question. “The bank know that I don’t live there myself, I don’t even have a key, but they were still happy to board up the house while Kate was immobilised in a hospital,” says Dylan. It’s not the first time they have stonewalled me – we have been attempting to negotiate a deal with them on the mortgage for months, but they won’t listen. After my phone call with Conor I knew I needed to get them into the High Court, which is no small thing. As a lay-litigant the process is daunting and intimidating – it’s still sinking in that I had to face-off with a skilled barrister like Rudi Neuman. The house in question was built adjacent to a number of Kate’s immediate family’s homes in 2003. Dylan had hoped to negotiate with non-profit organisation Clúid with a view to obtaining a buy-to-let arrangement that would allow Kate hold onto the house. Unfortunately, Clúid (or any similar organisation) cannot act unless given approval from the bank, as spokesman James Harold confirmed when contacted by TheJournal.ie. “We don’t comment on individual Mortgage to Rent cases for the sake of the privacy of all concerned,” he said. I can clarify from a general perspective that in all Mortgage to Rent cases, if the lender refuses to engage with organisations like Clúid Housing then there is absolutely nothing the organisation can do. The lender must be ready to engage in order for a Mortgage to Rent (MTR) agreement to be created. David Hall, director of the Irish Mortgage Holders Organisation (IMHO), sees the Mortgage to Rent scheme in Ireland as a solution not fit for purpose. Hall intervened personally last week with Leeds in an effort to force a stay on the eviction. “It’s an unmitigated disaster,” he told TheJournal.ie. The bank is the only party that can make a MTR happen. We should know, we handle 90% of them. “A deal with Clúid would have been a win-win situation for both us and the bank, but they just wouldn’t engage, even with Kate’s injury. They simply don’t care,” says Dylan. Ordinarily seeking an injunction of the sort Owens is asking for could cost anything from €10,000 upwards in legal fees. That’s money I simply don’t have, but in going before the courts myself it proves that there is room for a lay-litigant to get a result, albeit you need to have a couple of hundred euro and be very persistent. I can’t thank Stephen and David (Curtis and Hall, of the IMHO) and Finbar Markey (of the National Land League, not to be confused with the New Land League of Gorse Hill fame) enough for their help – I couldn’t have done this without their advice. TheJournal.ie has seen documents confirming both the eviction notice on the house and the Leeds Building Society’s refusal to engage with Clúid. We contacted Leeds Building Society for comment on the situation but could only engage with the bank’s head office in England, with the Irish office remaining silent despite repeated efforts to reach them. “Leeds Building Society adheres to the Code of Conduct on Mortgage Arrears (CCMA) and works with all customers who fall into arrears, to get their account back to sustainable terms,” a spokesperson told us. Under the CCMA the Society can seek a possession order where a borrower has failed to meet their mortgage payments in full, in accordance with the mortgage contract, unless the borrower has entered into an alternative repayment arrangement. Repossession is always a last resort. As things stand next Tuesday is now D-Day for Dylan’s application for an injunction on the repossession. He is confident that the judge was beginning to see his point of view this week however. “Kate’s injury will take months to heal. She’s going to need home care. The bank not caring about her situation was the final blow after years of awful dealings with them,” he says. It was never a case of not being willing to pay, it was an inability to pay (the family’s then businesses were both victims of the economic crash). Something Leeds have never cared about. It’s been a horrendous few weeks. The practicalities of school runs, and daily trips to Dublin have been extremely stressful for myself and my partner. On top of that my daughter is really worried about her Mam, and I haven’t even really been able to take her to the hospital with all this legal mess. But I will not stand back and let the bank take away my daughter’s home, without exhausting every possibility for resolution. That’s something Leeds Building Society has never shown any interest in. Email “A bank tried to evict a hospitalised mother and her daughter this week”. Feedback on “A bank tried to evict a hospitalised mother and her daughter this week”.